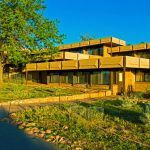 Contemporary style blended with natural touches make Thunderbird Lodge an ideal accommodation choice at the south rim of the canyon. Family-focused, the lodge has ample amenities to make for a memorable stay in the heart of the Historic District. 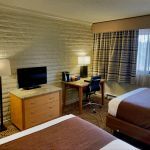 Many of the comfortable, modern rooms offer canyon views while others overlook Historic Village streets. Thunderbird Lodge is walking distance to restaurants, gift shops, Kolb Studio, Verkamp’s Visitor Center and Bright Angel Trail Head. Outdoor enthusiasts will enjoy the lodge’s location directly on the Rim Trail, which spans from Hermits Rest to the Kaibab Trailhead—approximately 12.8 miles. Please Note: Guests staying at Thunderbird Lodge will need to check-in at the Bright Angel Lodge Front Desk. 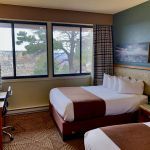 Situated directly on the canyon rim, many of the rooms at Thunderbird Lodge have partial canyon views available, called canyon-side rooms. The rooms have either one king bed or two queen beds. 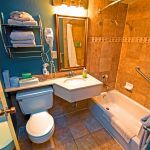 Guest room amenities include a full bath, in-room Keurig coffee maker, refrigerator, flat screen television with satellite TV, telephone, hair dryer, and safe. 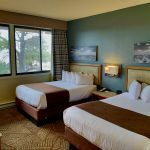 Thunderbird Lodge offers accessible rooms. 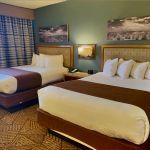 To see available ADA-compliant rooms check the “ADA/Accessible Rooms” box in the online reservations form or call Central Reservations (7a-7p MT) at (888) 297-2757.